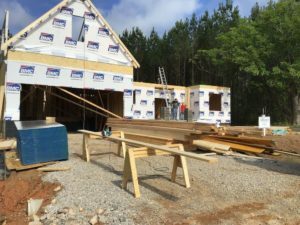 Cedar Ridge combines the diverse talents and experience of some of the Triangle’s top builders. Each of our custom crafted homes brings the unique touch of one of these fine companies. You can learn more about them below; click on the links for more. All of our builders are based in and around the Triangle, and have earned stellar reputations in the community. When you purchase a home at Cedar Ridge, your dream will be built by someone who once settled here with the same goal as you: to call the Triangle home. Led by Matt Baldwin, GranWin has a long history of creating beautiful custom homes with unique design accents, mixed materials, and unique interiors. GranWin is based right next door to Youngsville in Wake Forest. Haven Homes is led by Tom Petruccelli, who has built custom homes for over 30 years. In the Triangle, he has gained a reputation for his transparency and dedication to customization. Haven, too, is based in Wake Forest. Based in Raleigh proper, Heritage made its name through extensive remodeling ability, giving them an eye for detail and functionality that carries into their custom home designs. Find out more about this custom home builder today. With over 400 homes completed in the Triangle since 1986, Houseman Custom Homes (led by Woody Wilson and Mike Houseman) knows our area like few other builders. Owned by Desert Storm Veteran Brian Gower, Garner-based Profile Construction has been building homes since 1990. The company’s experience gives them a unique perspective on custom homes. Dan Tingen founded his custom home company in 1980. Since then, he has earned a reputation around the Triangle for his hands-on approach and dedication to quality.